What it is: More than a productivity book, this is a complete productivity system that helps you get the most out of many tools you already use. Who it’s for: People feeling overwhelmed and struggling to get things done. People who are looking for a leg up in the workplace or who enjoy the practice of life-hacking. Feeling overwhelmed can be like getting lost at sea. There are obstacles in every direction, and you’re never really sure if what you’re doing is helping. You can paddle endlessly, but without some guidance, you might just be making the problem worse. David Allen wrote a groundbreaking book on the subject called “Getting Things Done.” It had one central idea at its heart: Making lists will free your mind to tackle creative problems. Over the years, the system has helped thousands of people get organized to achieve that end. Allen was full of good ideas but short on practicalities for implementing them. That’s where Peter Brinton comes in. Brinton is a technology and finance consultant who holds a degree in economics from Brigham Young and an MBA from University of Virginia. He draws on his personal success to share a system for implementing Allen’s ideas, custom-tailored for the workplace. One of the challenges with implementing the “Getting Things Done” model is the amount of work it initially requires. If you’re relying on an external note-taking system, that extra work is quickly pushed aside when crunch time comes. Unfortunately, it’s during crunch time that you most need a system of organization. 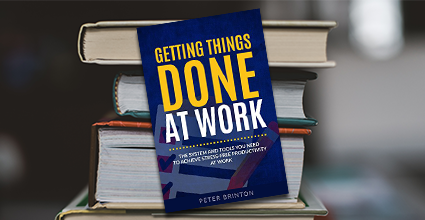 Brinton’s approach to this problem is simple: Integrate as much of the “Getting Things Done” system as you can into the work you already do. 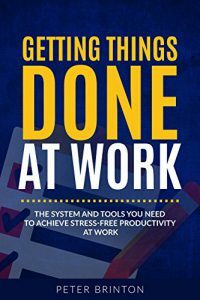 This book is filled with practical advice on how to use tools, like Microsoft Outlook and Excel, to build task lists and start tackling them. While that’s a tremendous strength of the book, it’s also one of its weaknesses. If you prefer Evernote to OneNote, or don’t already use the Microsoft Office suite, much of the content will feel pretty foreign. Brinton assumes a fairly high level of tech savvy on the part of his readers. The “Getting Things Done” system is a powerful tool to organize and streamline your workflows and processes. Brinton’s tools are a valuable addition to anyone looking to get started with a strong system. The combined advice and tools could be enough to make this month the month to get on track at work.